Explore o impressionante saguão do Woolworth Building nesta excursão guiada de 30 minutos em pequenos grupos em Nova York. Projetado pelo renomado arquiteto Cass Gilbert, o Woolworth Building, também conhecido como a "Catedral do Comércio", tornou-se um marco histórico nacional em 1983. Esse passeio básico inclui o acesso ao saguão não aberto ao público, a grande entrada do que foi o edifício mais alto do mundo por 17 anos. Aprenda sobre a história deste magnífico espaço, com informações importantes e tempo suficiente para tirar fotos e fazer perguntas. This tour was great! If you are interested in the history of the Woolworth legacy, it is amazing. The lobby is absolutely gorgeous--I can see why they call it the cathedral of commerce. A great thing to do on a cold day in New York City. 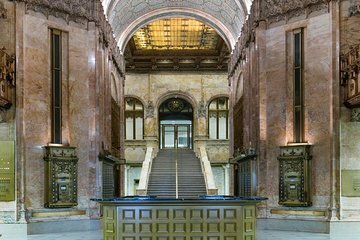 The Woolworth Building Lobby Tour was well done and our host very knowledgeable and was able to give context to the story. The building access is limited hence the Lobby tour, but was definitely worthwhile. Would recommend this tour for those looking for something beyond the major New York sites. It was great to have a tour of this magnificent building ans get to see the amazing workmanship both outside and inside the building. The guide knew a lot of its history and was very helpful. The only thing though is that it would be a good thing to have had access to the observatory level if only for a short time. Our guide was very knowledgable. He gave a very good tour.